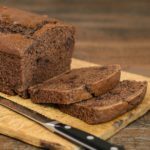 A recipe for Buttermilk Chocolate Quick Bread. It is a moist bread with a crispy crust. The bread has a little sweetness and is a real treat for breakfast or snack. Preheat oven to 350 degrees F. Grease the bottom only of an 8- X 4-inch or 9- X 5-inch loaf pan. Stir together the chocolate chips and 1 teaspoon flour in a small bowl to coat the chips with flour. Whisk together remaining flour, cocoa, baking powder, baking soda, and salt in a medium bowl. Beat sugar and butter in a large bowl until light and fluffy, about 3 minutes. Add eggs and beat to combine. Add buttermilk and vanilla and beat until smooth. Stir in the flour mixture until just moistened. Stir in chocolate chips. Pour into prepared loaf pan and spread out evenly. Bake for 55 to 60 minutes or until a toothpick or cake tester inserted in the center comes out clean. Cool bread in the pan for 15 minutes. Run a knife along the sides to loosen bread from the pan. Remove bread from the pan and cool completely on a wire rack.